From manna in the desert to the miraculous feeding of thousands to the last supper, God clearly shows his desire to feed us. After raising a young girl from the dead, Jesus instructs her household to tell no one. Then, as Mark's Gospel tells us, the Lord adds this poignant and tender aside: Give the girl something to eat. Scripture shows us how many followed Jesus because of his miraculous feedings of the multitudes. But there is another powerful component present whenever God provides earthly food: faith. In our more than 75 years of experience feeding the poor, CRS has learned that fighting hunger is not simply a matter of providing food. How food is provided is often significant, as in the Holy Land, where a voucher system helps families feed themselves while maintaining their dignity by providing training and employment. Our story from Madagascar shows how education about nutrition goes hand in hand with food programs. Pope Francis has spoken often about our quest to end world hunger. He has also pointed to the very foundation of any effort to feed the world. To kick off a campaign to end world hunger last December, Pope Francis started not with a food collection or a call for monetary donations. Pope Francis began this drive to end hunger with a wave of prayer. We know that we can't end hunger without God's hand. We also know that God works through his people. 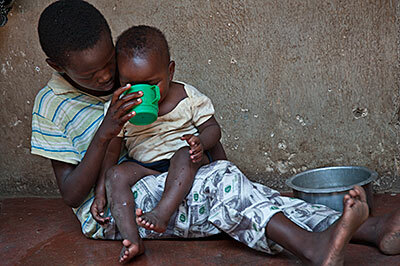 Ending hunger begins with, and is sustained by, our faith.